Let's be honest, restaurant trends don't dramatically shift every single year, so instead of giving you another list of trends to follow (boring! ), we wanted to explore last year’s top 5 restaurant design trends and share our thoughts on how they’ll evolve into 2019 and beyond. 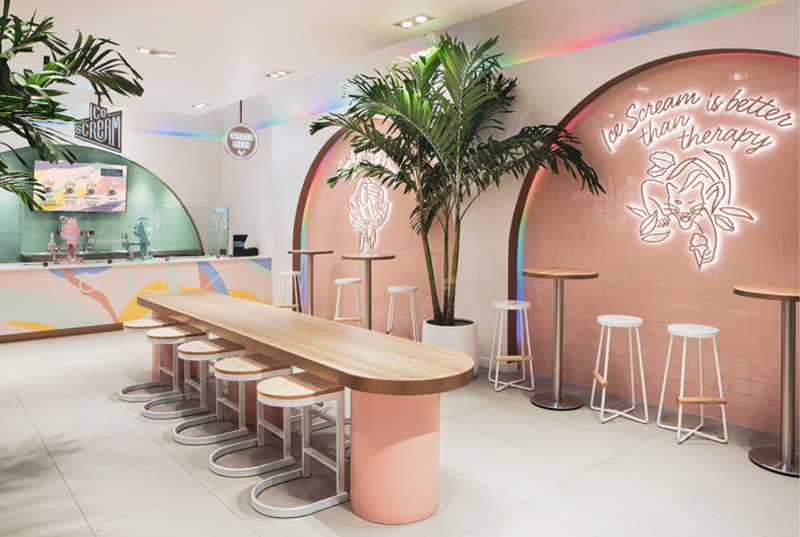 Whether you’re hoping to open a new restaurant this year, or revamp an existing chain concept, these are the 5 restaurant design trends to look out for in 2019. Growing up, food delivery was synonymous with pizza chains like Domino's or Little Caesars, but thanks to Uber Eats and other apps, food delivery has gone mainstream. While we love the convenience of delivery, the reality is, at the end of the day, we are all social creatures. That being said, the dine-in experience will never go away completely. 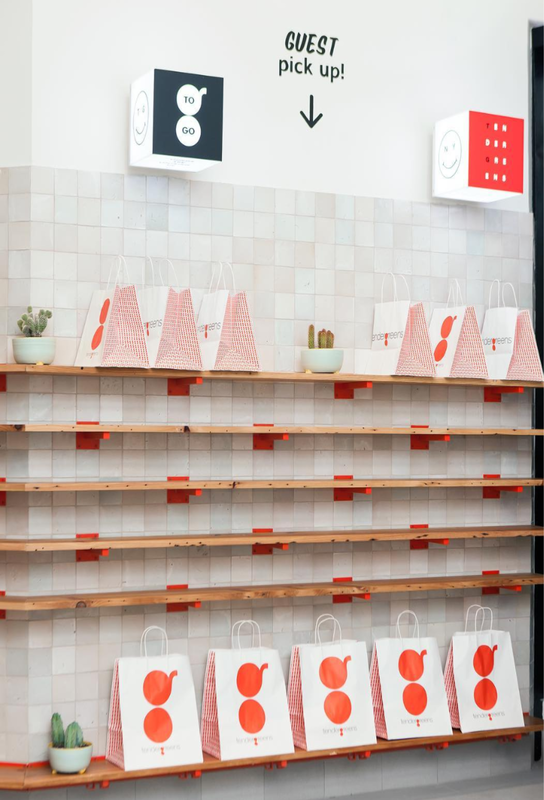 Instead, restaurant chains are adapting by shrinking the size of their dine-in spaces and taking the time to make the dine-in experience more innovative by adding design-friendly details to enhance their customer’s experience. Think better seating options, higher quality serving plates, and great branding. These smaller scale restaurants are designed to maximize speed of service for in-restaurant and take-out diners, while making room for digital app ordering and order pick-up. This blended use approach to a restaurant space is a fairly new need within restaurant spaces, and we predict will only become more common. 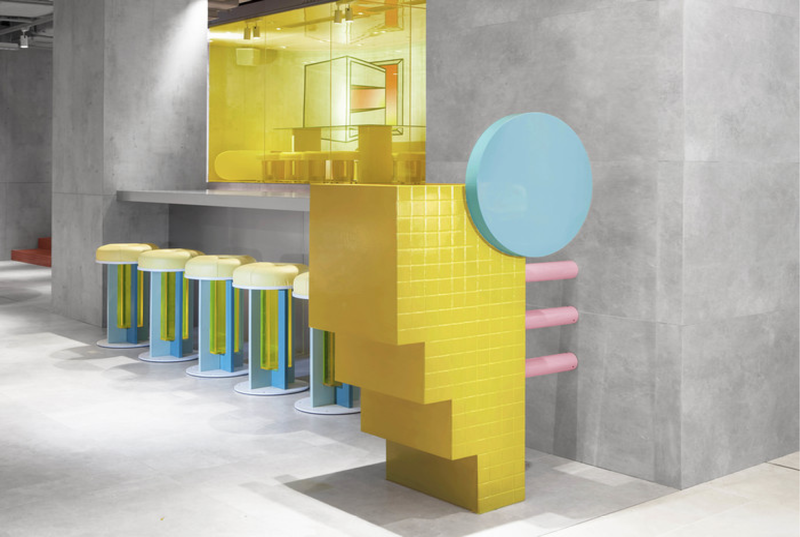 When it comes to interior design and branding trends, we're predicting that the 70s and 80s design influence will come back in full force, think chrome-like metallics, neon colors (like at this food stall), and bold graphics, and softer shapes. 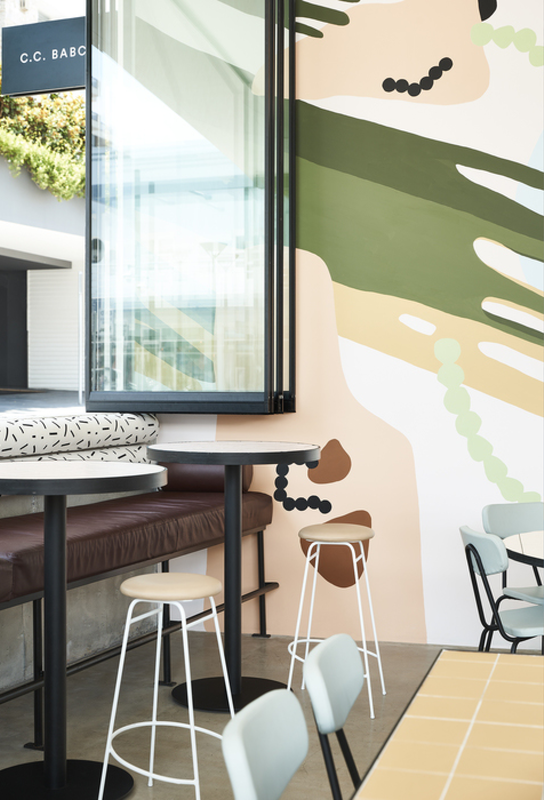 Over the past few years, restaurants have bounced between minimalist and maximalist decor—flaunting colorful, pattern-filled interiors one year, and then pared down, all-white spaces the next. 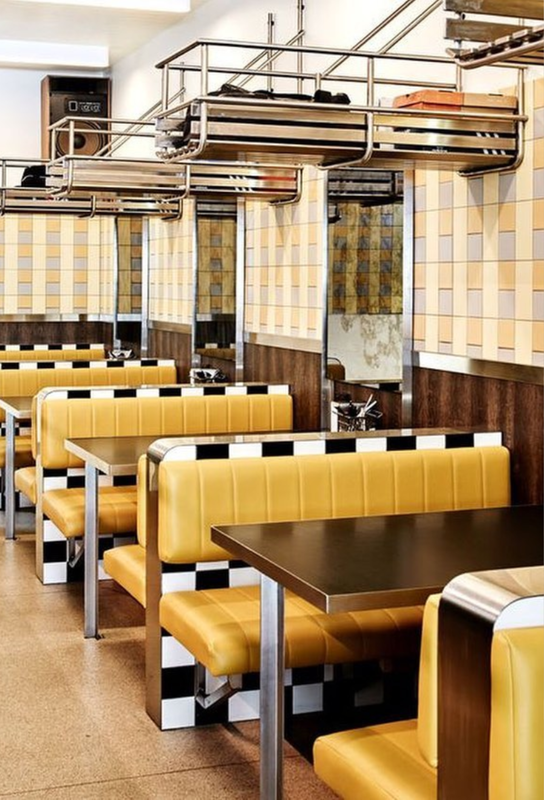 This year we’re confident that restaurant designers will find a sweet spot between the two extremes (think Wes Anderson meets a relaxed, California cool vibe). Restrained palettes and more natural materials like terrazzo, white oak, walnut, and cement tiles will add much needed natural elements to the space. Pared down doesn't have to mean uninspired, so don’t be afraid to use color! We’re really excited to see more earthy copper browns, vibrant salmon oranges, dusty blues, and olive greens showing up on our factory floor these days. The number one thing restaurant owners ask us to solve within their restaurant is bad acoustics. 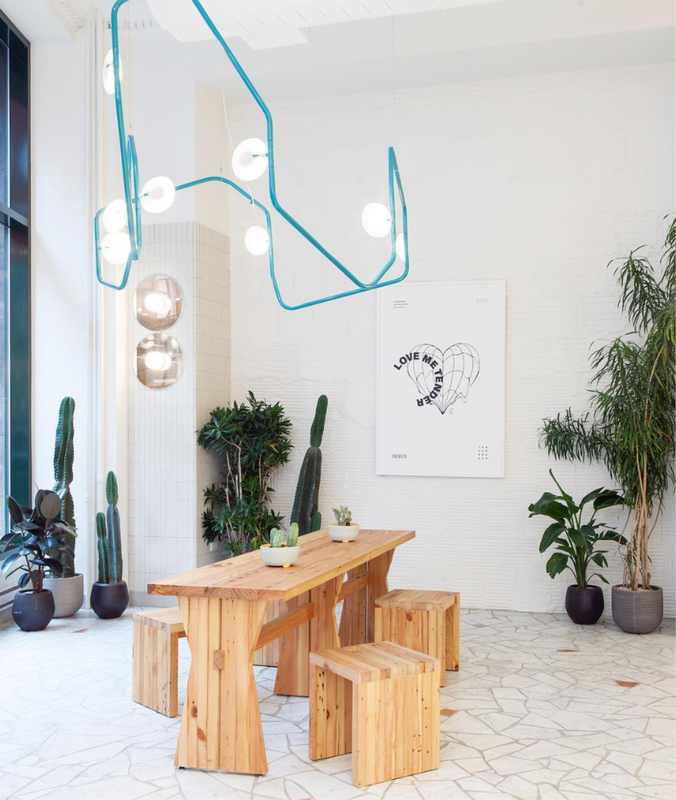 While the minimal, industrial vibe is great aesthetically (like in this restaurant), the stripped down, raw wood and metal look is not ideal when it comes to sound absorption. 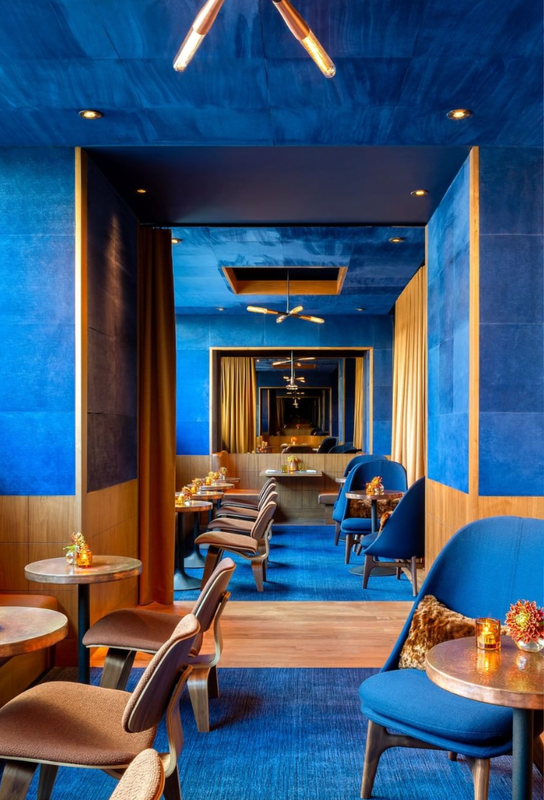 This year, expect to see more restaurants bringing upholstery back into their designs, whether it's on their chairs and barstools or more unexpected ways, like upholstered walls or with curtains and extended height banquettes. Adaptive spaces have become increasingly popular as restaurants have reduced the size of the dining room. Brooke Spreckman, the designer responsible for the beyond beautiful fast-casual chain Tender Greens, created a “chef’s table” application, which is the perfect place to put pick-up orders during the lunch rush, but also doubles as a chef’s table in the evening. Another great example of this is at El Thrifty and Proxi. In both restaurants the designers, B. Berry Interiors and Meyer Davis, respectively, used furniture to define the atmosphere within the space. For El Thrifty, Berry used bleachers, over-sized sofas, bar height tables, lounge chairs, and traditional seating options to define spaces within the restaurant. Bleachers are used in the game area overlooking pool tables. 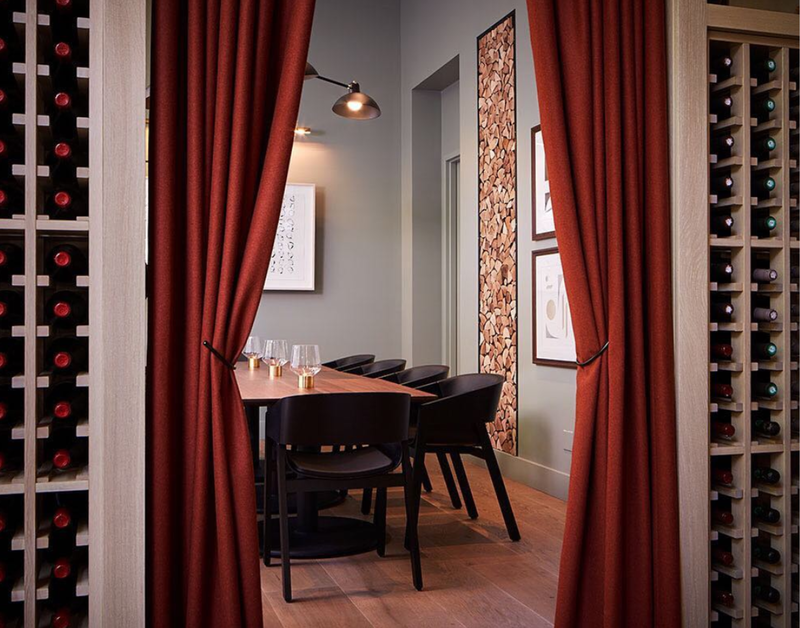 The second restaurant, Proxi, immediately invites you to grab a drink and relax. The lounge area allows restaurants to adapt easily to where and how people dine out evolves. Creating authentic spaces that reflect the local culture will go a long way when trying to win customers (and creating repeat customers). Capturing the spirit and heart of your community through the use of local artists and local furniture suppliers are just a few ways to achieve that feel. McDonald’s famously pioneered this approach (and made it scalable) to their units years ago by offering 10+ different design packages for their franchisees to choose from to best cater to the demographic needs and wants of that regional area. Since then, this approach has blossomed. You’re seeing chains designing each restaurant differently, carrying over some similar characteristics but embracing local landmarks, artists, and history. There has been a sort of design renaissance over the last few years. People are taking more chances with restaurant design and creating the best customer experience. We’re excited to see how these trends are interpreted this year and what new ones will emerge. 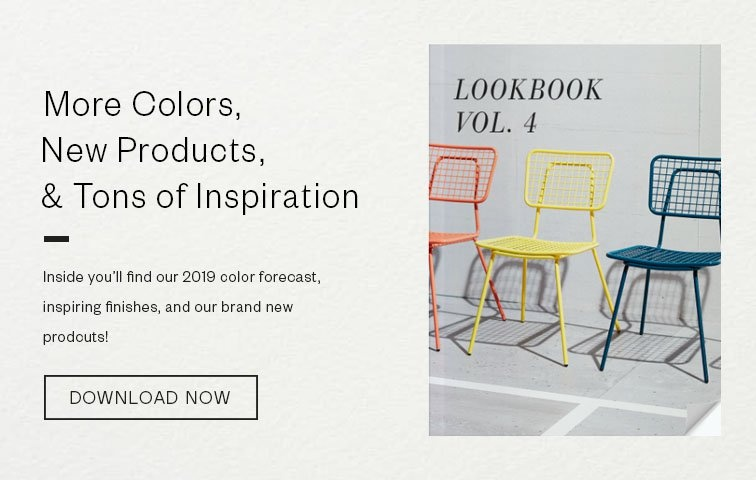 If you’re interested in more inspiring ideas and images download our new Lookbook. On a side note, one thing we’ve noticed lately is the use of built-in, bleacher style seating. Places like Buffalo Wild Wings to Holy Matcha are incorporating this into their interior designs… what are your thoughts on this new seating style…love it or leave it?